My daughter loves to wear it! This is her second dress just like this. She got a plum one last year. Sadly, she has out grown it and so we bought her this one. She loves it! The dress is beautiful and modest. My one big not would be. I bought the med for my very small 7yr old and it fits perfectly. But she wears a size 5t for tops. So go a size up. Wonderful dress. I just ordered my 11 year old a second one in a different color. She had to buy the first one for her sisters wedding. She loved to wear it! It is comfortable and washes well. Very easy to take care of and very nicely priced. What more could a mother want in a dress??? Love it! 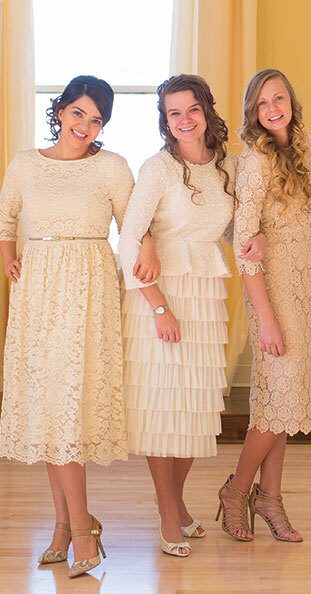 I bought this dress for the two young girls, that are to be in my wedding! They love em! They fit perfect and the dresses are comfy:) they look really good on the girls!!!!!! From one seamstress to another: This dress was excellently executed from start to finish. The only qualm I have is they run small. Other than that? Nothing!! You will not be disappointed in the quality. Definitely in love and will be coming back! This dress is amazing!!! Although I find that it runs small. Ordered this on a Saturday and had my order by the following Thursday, very impressed with shipping! !